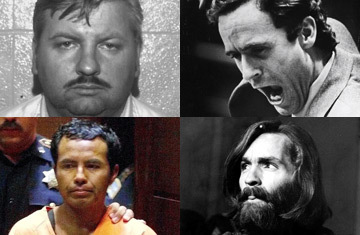 Clockwise from upper left, John Wayne Gacy, Ted Bundy, Charles Manson, Angel Maturino Resendez. A form letter from Martha Stewart, written on her trademark Living stationery and sent to supporters during her prison stay, sells for $25. An envelope hand-addressed by jailed Panamanian General Manuel Noriega is $350. Both are for sale on "true crime" Internet sites. But beyond the odd curiosity of a prison thank-you note from America's housekeeping guru and an innocuous envelope from a fallen dictator lies the online shopping world of macabre, shocking and soul-chilling prison collectibles  magazine fashion ads defaced with satanic symbols and stained with the bodily fluids of a campus shooter, a sketch of a headless victim drawn by a Death Row murderer, even fingernail clippings and foot scrapings from a serial killer. "Odd is good. Odd and rare is really good," says Tod Bohannon, who operates murderauction.com out of his Georgia home. But Bohannon, who describes his passion for prison memorabilia as a "hobby," is concerned that a proposed federal law could shut him down. The bill, filed in late May by Republican Senator John Cornyn, takes aim at the trade by forbidding prisoners from using the U.S. Postal Service to deliver or receive items for profit. The bill has been referred to the Senate Judiciary Committee, where it is likely to face criticism from civil-liberties groups and support from victims' rights advocates. Dubbed "murderabilia" by Andy Kahan, director of the Houston-based Mayor's Crime Victims Office, the sale of what many consider grotesque items is already banned in five states  Texas, California, New Jersey, Michigan and Utah  thanks in great part to Kahan's lobbying efforts. In 2001, Kahan also successfully pressured eBay.com to drop "murderabilia" listings. But since much of the selling happens on websites operated beyond the five states, the legislation has had limited effect on Internet sales. There are five major U.S. dealers of murderabilia, according to Kahan, operating out of Georgia, Arkansas, Montana, New Hampshire and Massachusetts. The dealers operate using the eBay model: sellers post their offerings and collectors bid. Some items come from the prisoners, their families, or even attorneys; other sellers simply write to notorious prisoners and ask for letters, personal items or artwork. Kahan alerts authorities to online sales, even buying up items to take them out of circulation, but he says that dealers are hard to pin down. "It's like trying to exterminate cockroaches  they move from one site to another." Murderauction.com's Bohannon, whose passion for his true-crime hobby began as a teenager hanging out at the county jail with his deputy sheriff father, uses a U.K. server to host his site since he claims Kahan has intimidated his U.S.-based hosts, warning them that they could face civil litigation. The top-dollar "stars" of the sites are Charles Manson, serving life in prison for murder, and the late John Wayne Gacy, the serial killer executed in 1994. Manson's prison art gets three- and four-figure prices; even his prison flip-flops are for sale. On daisyseven.com  whose logo proclaims "Where Crime Pays. Every Day"  a license plate from Gacy's snow plow is up for $1,700, a Gacy rosary for $3,000. Daisyseven claims that no criminals receive financial gain from any sale, but the money trail can be difficult to track if prisoners use go-betweens like attorneys or family members. In most states, prisoners are prohibited from operating businesses from behind bars  rules aimed at drug dealers and organized crime  but they can have funds deposited in commissary accounts to purchase snacks, drinks and newspaper subscriptions. In Texas, with 153,000 inmates in the penal system, it is impossible to screen every piece of mail, says Michelle Lyons, a spokesman for the Texas Department of Criminal Justice, and mail to and from attorneys and the media is privileged. Random screening does catch some illegal activity, which can be punished with the loss of privileges and more prison time. When prison authorities found out the so-called "Railway Killer" Angel Maturino Resendiz was selling his fingernail clippings from prison, prior to his execution in June 2006, his mail was flagged, but not before the items made it out into the marketplace. Despite the prison prohibition forbidding for-profit sale of artwork, many of the pieces sold by Ed Mead on his prisonart.org web site come from Texas, many of them panos or "handkerchief" art, a medium favored by Latino prisoners in the Southwest who do intricate ink drawings on squares of ripped sheets and other material. Mead makes copies of the works, scans and posts them on his website, charging a small commission fee if they sell. He says he rejects any art that he considers racist, sexist or homophobic and does not sell pieces by notorious killers. Recently, he refused artwork from Christopher Scarver, whose claim to fame is killing Jeffrey Dahmer. Operating out of San Francisco, Mead, who served 18 years in Washington State for crimes committed in the '70s as a member of the revolutionary group George Jackson Brigade, is now a prison-reform activist. He says art gives prisoners a sense of themselves, raises their self-esteem and keeps them busy. Cornyn's bill, he adds, "is an attempt to pass another 'Son of Sam' law," referring to the 1971 New York state law aimed at blocking potential book profits for notorious criminals like "Son of Sam" killer David Berkowitz. The U.S. Supreme Court overturned the law in 1987, finding it overly broad and in violation of the First Amendment free speech rights. The proposed federal "murderabilia" law takes a different approach by targeting prisoners' involvement in interstate or foreign commerce, and it applies to all prisoners, state or federal, levying fines and a minimum three-year penalty for breaking the law. "The [new] bill does cause some concerns," says Marv Johnson, legal counsel for the American Civil Liberties Union in Washington, D.C. "It's a bit too broad and does raise some First Amendment issues by affecting protected activity." Even if the bill does pass, the trade will continue, Bohannon insists: "If they shut it down, they will force it underground." Mead agrees, and notes that despite rules at California's maximum security Pelican Bay prison limiting prisoners' access to artist materials, art flourishes; prisoners scrape the colors from magazine ads and use manila envelopes as canvases. Donny Johnson, a well-known Pelican Bay artist, dissolves M&M candy for his colors and uses a paintbrush made from his own hair. But most notorious prison art, Kahan says, only inspires more pain and horror for the victims. In April, Denise Johnson and Victoria Snider, whose husband and sister, respectively, were killed in 2002 by the Beltway Sniper, Lee Boyd Malvo, were shocked when they learned that his sketch of Osama bin Laden was for sale on murderauction.com. The starting bid was $399, but so far the Canadian seller nicknamed "Redrum"  murder spelled backwards  has yet to sell the crudely drawn portrait. "It would be worthless without Malvo's name on it," Kahan says. "It is profit from ill-gotten notoriety."